“Slayer?” you might say, “I’ve filed down my barbs and I’m going to release ‘er.” Regardless of whether you’re fishing to commune with nature, sate your inner carnivore, or just get some peace and quiet, you would not be remiss for selecting the Native Watercraft Slayer Propel 10 as your vessel. This propel kayak is neither the most nor the least expensive on the market. Despite its cost, it stands head and shoulders above the crowd in numerous categories. Native Watercraft was the first company to come out with this style of propel drive. Compared to the Hobie Mirage Drive, which is engineered to the nines, the setup on Native Watercrafts is simple. As you sit in the chair, you turn the pedals around in a circle. Those pedals power a propeller beneath the hull, and off you go. Unlike many systems, Native’s drive is completely sealed and self-contained and covered with anodized aluminum and stainless steel. If this aluminum were not anodized, you might very well have a science experiment on your hands the minute you set this vessel in a conductive environment (e.g. fresh or salt water) which would result over time in some serious galvanic corrosion. If you really bang up the drive and chip off some of the protective coating, this may begin to happen. But by and large, the metals used for this propeller drive make it sturdier than most. Because this drive is self-contained, it foreseeably would be more difficult to repair if it breaks. We have not, however, heard of this happening and we generally prefer Native’s propeller drive to other models, which are not self-contained. Moving on, the Native Slayer Propel 10 really shines when it comes to the rails system. Many fishing kayaks we investigate have no rails at all. Others have rails right along the captain’s chair. Others still are unique in design and can only hold products made by the same company (we’re pointing at you Hobie). The Slayer, however, features four rails—two on either side of the captain’s chair and two along the aft storage compartment—that can hold most fishing accessories. Many of us anglers don’t even own four different fishing accessories. It’s luxuries like these that provide for some of the finer things in life, like rail mounted cup holders, cell phone holders, and mini downrigger lake trollers. While we’re on the subject, the Slayer also has a sweet mount right on top of the pedal drive system. This is where you want to stick your fish finders, your back up cup holders, a flower vase mount, or whatever else you might want to stare at while pedaling. There’s also a great rod holder immediately to the right of the captain’s chair which dangles your lure right before your eyes and makes changing lures much easier. When it comes to storage, the Slayer has a sealable bow compartment that can hold most things you would want to keep dry. It’s a good place to stow lunch, beverages, and ice. Behind, there’s a bungie-covered open compartment. It should be noted that this storage is shallower than many other kayaks. This is likely shallow to boost hull capacity and increase stability. There’s also a small, sealable compartment in the aft. Aussie YouTuber Wol-Gran figures this is more for hull access than anything else. The hull design is also pretty cool. Turn the Slayer over, and around the middle, you’ll find a large concave section. For reasons we do not fully understand, this significantly increases the vessel’s stability. Behind this section, there’s a short keel intended to keep the boat tracking straight and protect the rudder behind. When it comes to stats, this kayak definitely dresses to impress. To begin, it is incredibly light. Without the pedal drive, it only weighs 62 lbs. According to the company, that makes it the lightest kayak of its size on the market. That weight also just might mark the difference between hauling the kayak via trailer and loading it on top of your car or in the bed of a truck. As its name suggest, it stretches 10 feet in length. In width, it’s a hefty 34 inches. Many kayaks of the same size will be slimmer and tippier, as are some longer ones as well. For how much it weighs, its weight capacity is also pretty astounding: it’s rated for 500 lbs. When it comes to any solo fishing kayak, there’s one question that stands out in many anglers’ minds: can I stand up in it? The answer regarding the Native Slayer is generally in the affirmative. Fishing draws all different kinds of body types and comfort levels with varying stability, so we often hesitate to say definitively whether or not you will be pleased with a given vessel. But after referring to the multitude of videos reviewing the Slayer, we can conclude that most anglers will be comfortable standing up in it. Reviewer after reviewer, including Greg Sterley, and several others, demonstrates how standing up for sight casting in the Slayer Propel 10 is viable and undeniable. In a more zoomed out sense, we tend to believe that the engineers and designers at Native Watercraft really know what they’re doing. There are numerous small, seemingly insignificant touches about the Native Slayer Propel 10 design that work as an ensemble and create a sum that’s greater than its parts. This can be seen with the side rod holder angled so that it’s easy to change lures without gripping it between your legs (most rod holders are vertical and some cannot be easily reached). It comes out with the mount on top of the propel drive that can be hooked up through the transducer scupper, making it perfect for a fish finder. It can be seen with the two drain plugs. As the vessel floats freely on the water without anyone in it, unplugging these will drain what water you have in it almost instantaneously. Putting the propel drive in and out is incredibly easy. The list could go on. The attention to detail is nearly unmatched. While there is a lot of good to say about this kayak, there must also be some bad. As stated eloquently by Mark, this stubby and stable 10-footer does not track well over long distances, especially when the wind picks up. If you don’t have far to go, that’s no concern. But if you’re looking to pedal several miles in varying conditions, you’ll be served better by a slimmer vessel with more tracking capabilities like a center board (as available on the Hobie Pro Angler) or a wider rudder. The propel drive is sturdy, well-constructed, easy to put in and take out, and can go forward and in reverse. There are four rails that can hold probably more mounted fishing accessories than you own. There is no want of storage. This kayak is very light. It can be loaded and unloaded from the top of a car without any real risk of hernia, etc. It is very stable for its size. Stand up sight-casting isn’t just for light of foot in this vessel. Many design features, like the angled rod holder, the mount on top of the propel drive, the drain plugs, and the hull design, really tickle our fancy. It doesn’t track well over long distances. The propel drive stretches 16” below the hull. In shallow water, you’ll have to raise up the prop and get out your paddle. The most sensible comparison and contrast to the Native Slayer Propel 10 would be the Hobie Outback Mirage. They’re similar in price and both have pedal drives. But when comparing stats, the similarities fall away. The Outback is nearly 40 poiunds heavier, is one inch slimmer, is two feet longer, and yet it has a weight capacity of 400 pounds compared to the Slayer’s 500 pounds. Many thousands of words could be written comparing the Mirage to the Propel pedal drive systems, but it really comes down to preference. See our Hobie Mirage Outback Review. If you’re like most humans on planet earth and price is a real concern, it’s worth looking at the Perception Pescador Pilot 12 as well as an alternative to the Native Slayer Propel 10. You’ll save several hundred dollars with this kayak depending on where/when you buy and how friendly you are with your local retailer. But saving in price means losing elsewhere. This vessel is significantly more tippy than the Slayer. It’s heavier, and many anglers have had issues with the pedal drive system, which by many accounts is not comparable in quality to Native Watercraft’s. See our Perception Pescador Pilot 12 Review. It really takes a very particular angler to find a prohibitive issue with the Native Slayer Propel 10. It’s certainly not the cheapest, but it’s also far from the most expensive. 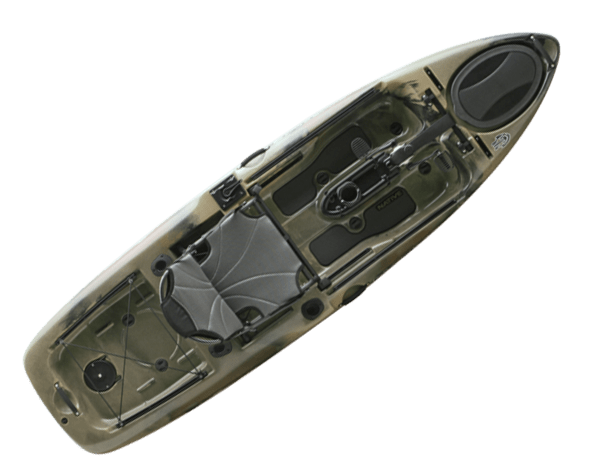 In general, the well-designed and high quality features of this kayak add up to make it one of our favorites on the market today, especially in terms of its cost to quality ratio.